On the strength of their previous release, "Salvation Denied," Severance gained a major label contract with Spain's Repulse Records. Already available in most of the world since early 2001, "What Lies Ahead ..." was picked up by WW III Records for its proper North American release. 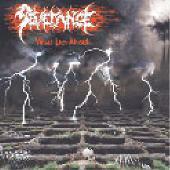 Severance's brand of brutal death metal has received a good buzz in the underground extreme music scene. While my indifference for brutal death metal is well known to Rough Edge readers (you need only look at my reviews of Immolation's material to see how I feel about it) I'm always willing to give any band a fair shot. The twelve tracks on "What Lies Ahead ..." have a bit of a thrashy feel to them which makes it a bit more palatable to me although this disc won't make me a brutal death metal fan either. Opprobrium and Dying Fetus immediately come to mind while I'm listening to Severance - hopefully that point of reference will mean something as you read the rest of this review. Many of the songs are longer than the average death metal song which, in the grand scheme of things, probably puts them more in the Opprobrium camp than the Dying Fetus camp. The twelve tracks on "What Lies Ahead ..." makes it difficult for me to listen to more than half of it in one single sitting, but it's got a lot going for it otherwise. The slow grinding parts of "As I Wait" were cool and the overall bludgeoning of "Painfully Reborn" had a debilitating kick to it. "Holocausto Obscuro" has a groovy rhythm to it that most brutal death metal bands can only hope to achieve. "Cross-Breeding" clocks in at a crushing eight-minutes and twenty-two seconds - not too many brutal death metal bands have the guts to stretch their material past the four minute mark let alone double that. Severance will definitely make a name for themselves in the brutal death metal scene as their perseverance is paying off. Any band that can stay together for thirteen years, even with minor line-up changes, deserves to be heard by the masses. The production on "What Lies Ahead ..." is quite good, which really caught me by surprise. The sound of "What Lies Ahead ..." is thick and clear (as far as brutal death metal allows for musical clarity). Fans of Pessimist, Immolation, and Opprobrium will love Severance's "What Lies Ahead ..." and its heavy attack on the brutal death genre. Severance is Joe Vasquez on vocals, Ralph Gutierrez and Lupe Duque on guitars, Abiel Barrera on bass, and Jaime Perez on drums.